Have you ever seen a doodle you loved, but when you went to see it again it was gone? Ever curious about what doodles in Italy look like, or how your favorite holiday has been celebrated each year? Or wanted to get a behind-the-scenes scoop on the recent Les Paul doodle, and maybe share it with your friends on Google+? If you answered “yes” to any of these questions, then take a look at our revamped Doodle site. Since our very first one in 1998, doodles have been our way to share with you the things we love or are excited about. In the past few years we’ve started to create doodles that people can not only look at but also play with. Our first interactive one featured a clickable slideshow of Halloween candy in 2009 and since then we’ve invited people to insert a coin to play an arcade classic, watch a film, and even compose an epic guitar solo, all on the Google homepage. 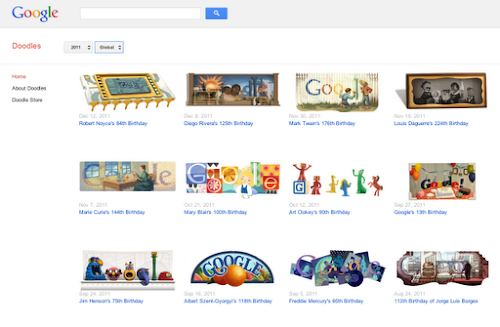 We’ve always thought it was a little sad that doodles are only available on the homepage for a day. Since we’re firm believers in having too much of a good thing, we set up a gallery of all our previous doodles a while ago. Now on the new site, you can browse, watch or play with over 1000 doodles. Enjoy front-row tickets to a Martha Graham dance, send the first man to space or learn more about why one doodler decided to “cartoonize” Mary Blair. You can even start wearing doodles, or hanging them on your wall, since the new site includes a link to our new Doodle store featuring all kinds of doodle swag. Happy doodlin’!